If ever you had occasion to be excited about your awesome nerdiness, it would be when you were accepted to Ravenclaw. This is the house you always wanted. The house that values intelligence over almost everything else. And everyone is a little eccentric, so your collection of books—all of which have deadly plants pressed into the pages aren't going to be that weird to your housemates. And now that you are in Ravenclaw you need to start looking the part. This Ravenclaw Tie is a great place to start. The dark blue color, and magnificent eagle on the crest go with any outfit. You will be so excited when you put on your Hogwarts robe, and start attending classes. Let's face it you already read all the books assigned by your professors, haven't you? We would have too, but we are still waiting for our acceptance owl. A Tie, with na embroidery, what else can I say. This is a high quality tie. 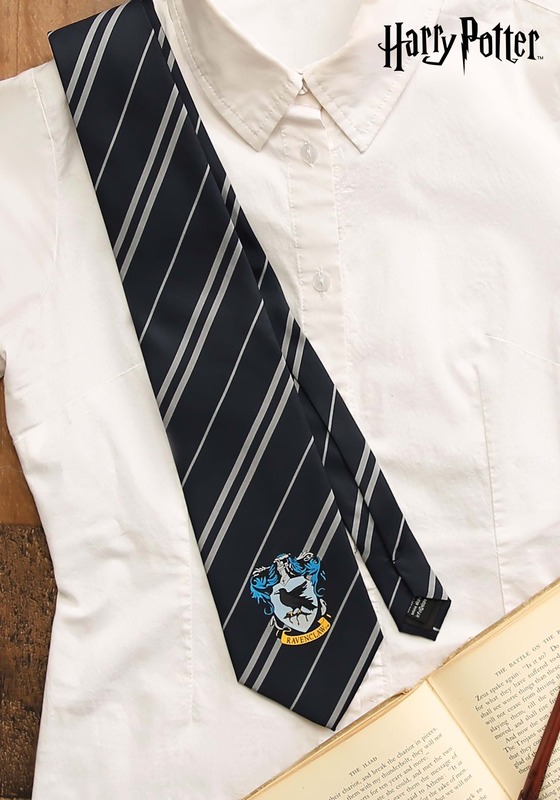 I don't think I would wear a Harry Potter tie when it isn't Halloween, but this is nice enough to do so. Maybe for Christmas.